You are currently browsing the tag archive for the ‘racial supremacy’ tag. Pratchett and vampires? Oh you do know how to make me happy. I have always liked the Discworld take on vampires, which is essentially that they are pathetic poseurs (which is how you spell ‘posers’, in this instance). However, the Discworld also happens to be a fantasy world where racial pluralism is a reality (take that Tolkien!) so there are vampires who are members of the Black Ribbon society in Ankh-Morpork. Sure they are undead, but do they have to live as monsters? – is their creed and it is a very amusing take on the traditional fiend. 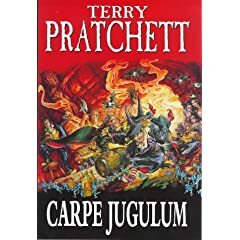 With Carpe Jugulum Pratchett returns to oldschool vampires, with a slight twist. No more talk of temperance. Just systematic murder, organised under the simple principle of their being superior to humans and all the other ‘low’ races of the Discworld. The story itself is set in the kingdom of Lancre, the setting for most of Pratchett’s Witches novels. Now some folk like Rincewind, others Vimes, but my personal favourite Discworld protagonist has always been Granny Weatherwax, the witch who will brook no nonsense (needless to say I am also a big Nanny Ogg fan). At the start of the story Granny is feeling her age once again, as well as a sense of isolation. She abandons Lancre in a fit of pique, believing that she was snubbed by her fellow witches and Queen Magrat when she does not receive an invitation to the royal baptism. Of course her departure comes at the worst possible juncture. King Verence, the former court fool who was revealed to have royal blood, is once again trying to be modern and extends an invitation to a very important family from the Überwald region. Except of course they are vampires and by inviting them, Verence has literally just handed them the keys to the kingdom. Only Agnes Nitt seems to be immune to the glamour of the vampires. The youngest of the Lancre witches, Agnes literally has a thin girl inside her trying to get out – which is to say, she hears this voice in her head making a running commentary on everything that she does wrong. This ‘Perdita’, allows her to resist the influence of the vampires, enough for her to realize what is happening to the rest of the citizens of Lancre. Her only companion is a young priest from the theocratic state of Omnia, last seen in an early Pratchett novel Small Gods (which happens to be one of my favourites). Mightily Oats suffers from profound religious doubt about his vocation, so like Agnes he too is of ‘two minds’, about everything. Together they try to organise the people of Lancre to rise up against the racial supremacist vampires and find Granny Weatherwax before it is too late. Pratchett is simply too clever by half at times. Yes on initial inspection this book seems like a merging of Small Gods and that *other* book about Lancre falling victim to an invasion Lords and Ladies. It is a brilliant combination of themes though. The crisis of faith suffered by Mightily Oats allows the writer to expound on his humanist beliefs to great effect. What’s more the book also addresses the limits of tolerance in multicultural society. This is something of a bugbear with me, the notion that ‘multiculturalism has failed‘ continues to gain traction in political circles, which is absurd as the definition of what it means seems to change all the time. Different races living together is nothing new. What has changed is that now there is this expectation that races should be treated with equal respect, under a shared national identity, which is where politicos come grinding to a halt. How can a statesman exploit class and racial divisions in a multicultural society? The very idea. Pratchett wittily dispenses with all of this in a book about vampires, little blue people with Scots accents and a dwarf highwayman. This is why he is the master.